CareBridge integrates your EHR with all other health IT systems to create a truly interconnected network of patient data that is easily shared, managed, and accessed across healthcare enterprises and information systems. Our vendor-neutral EHR integration engine breaks down the barriers associated with proprietary technology, combining patient data from various disparate systems into a unified view of the patient. 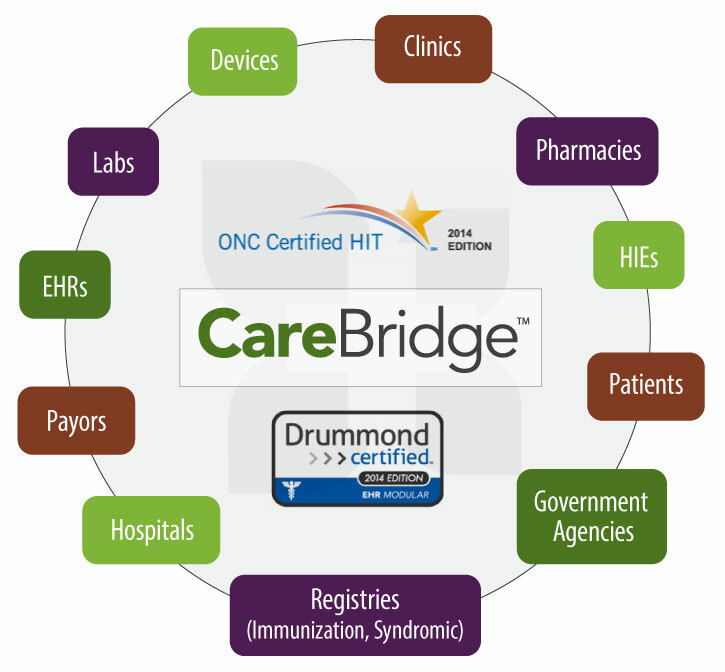 Whether your health delivery organization is trying to meet MACRA requirements, migrating data to a new EHR or partnering health information exchange (HIE), or integrating two disparate EHR systems during a merger, acquisition, or other transition, CareBridge delivers data to the right place at the right time. Our goal is to make sure all data is mapped and presented to the receiver in a meaningful way. With our ONC certified interface engine, you can define the business logic to manipulate, consume, or extract data to match your existing or desired workflow. Not sure what data you need? Our healthcare IT consultants have the clinical domain knowledge to help you leverage the data that is essential to your specific workflow, patient interaction, and business goals. Many healthcare organizations don’t know how to manage the vast amount of data available from pacemakers, insulin pumps, and other implanted and wearable health devices or how to make it available to providers where and when they need it, like within their EHR. eMedApps specializes in populating health IT systems with data from any source to enhance patient outcomes and improve meaningful decision support. By manipulating data and converting file types to fit the final destination’s needs, we make data transfers more efficient, reduce IT support involvement, and enable more intelligent clinical decision-making. Our CareBridge Management Console helps clinics and health systems manage health IT interfaces. Group interfaces together to easily monitor for errors, messages, and status updates from our comprehensive dashboard. Add inbound interfaces to receive data from any external party in HL7, XML, EDI, CCD, FHIR , and other common healthcare formats as well as proprietary formats and flat files. Setup outbound interfaces to send data to external trading partners in the format they need. Easily configure tasks to transmit or receive data on a schedule. With CareBridge, we can include logic to manipulate data to meet the needs of your workflow, making your systems smarter, faster, and easier.